Hi everyone! I'm looking forward to being a guest on American Patchwork and Quilting radio later today. Host Pat Sloan and I will discuss my new book, A Bit of Appliqué: Easy Projects with Modern Flair, as well as other quilty and sew-y things. The show will broadcast live from 4 pm – 5pm Eastern time. You can listen live by visiting All People Quilt’s link. And I'll be sure to link up the podcast when we're done, in case you'd like to listen later. You can subscribe to all the previous American Patchwork & Quilting talks in iTunes and listen anytime. If you need help, Pat has links and instructions for listening to the podcasts on the radio show page of her website. 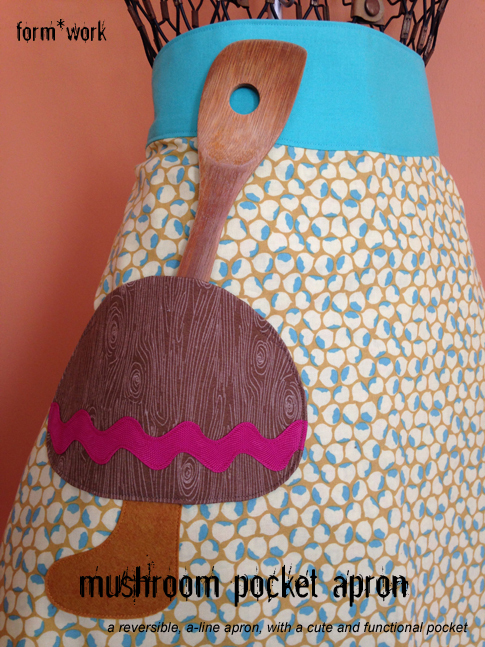 I originally designed this whimsical and flattering apron for my book, A Bit of Applique. It didn't make it into the book due to space constraints, and since I'd already done most of the work, I'm making it available as a free pattern here! The Mushroom Pocket Apron is reversible, has a very flattering, swingy a-line shape, and, best of all, is adorned with a completely adorable mushroom applique... which is also a functional pocket! (Thus the very ingenious name.) So start gathering your giant ric rac and some happy fabrics. 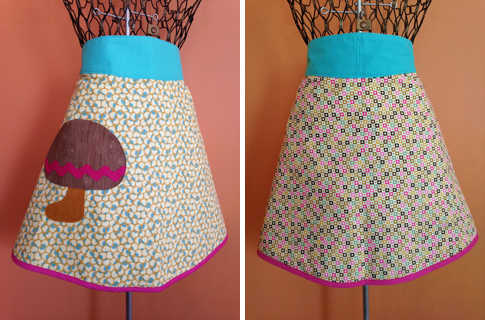 The Mushroom Pocket Apron pattern is available in PDF format here. It includes full instructions and illustrations, as well as all the pattern pieces you will need. I think you'll enjoy both making and wearing this delightful project. If you do, please post a pic on Instagram and tag me (@formwork). I'd love to see what you make!! Introducing... A Bit of Appliqué! Yippee!! The release date for my book (Yes, I wrote a book!!) is only a few days away! 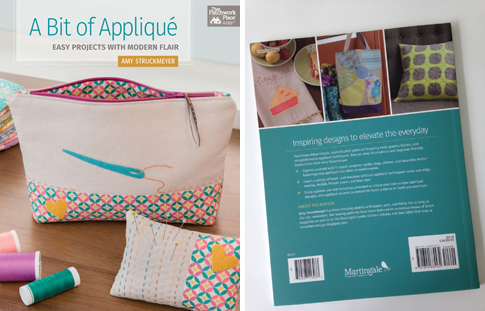 A Bit of Appliqué: Easy Projects with Modern Flair starts shipping next week, on July 14. It seems so long ago (yet it was only last summer) when I sent the manuscript and projects off to Martingale. For all that time, and even longer, I had to keep almost all of it secret. It's hard to describe how excited I am to finally reveal this! I have much more to say about writing the book and what it contains, but for now I'll keep this short and sweet... and simply show you a few sneak peaks. Transform everyday projects -- quilts, pillows, bags, and wearable items -- into one-of-a-kind objects with a variety of hand- and machine-stitched appliqué techniques. 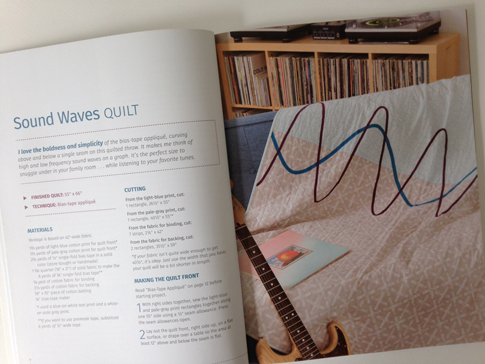 Learn bias tape appliqué with the Sound Waves Quilt. 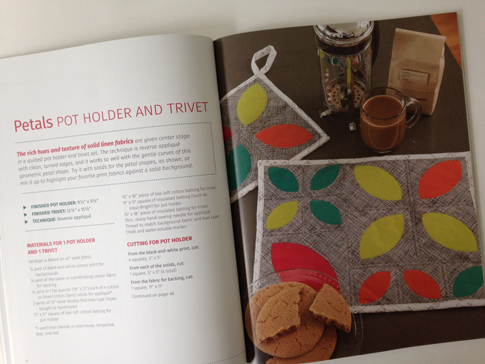 Or reverse appliqué with the Petals Pot Holder and Trivet. Practice raw edge appliqué with the Circles Baby Quilt or Polly the Penguin Softie. 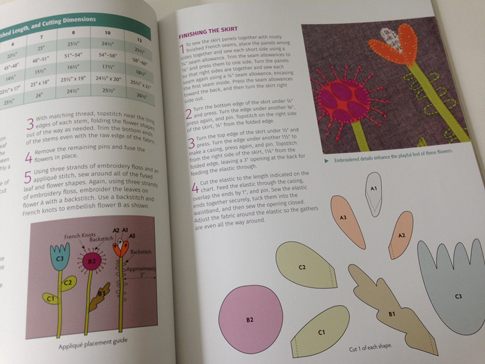 A Bit of Appliqué contains full size templates and clear instructions with plenty of helpful illustrations. Here's a sample page from the Garden Skirt section. If you've been wanting to try appliqué, or feel inspried to further your appliqué skills with one or more of these quick projects, I hope you'll check it out! Learn more, and see all the projects in the book, in Martingale's shop. Or find it on Amazon. 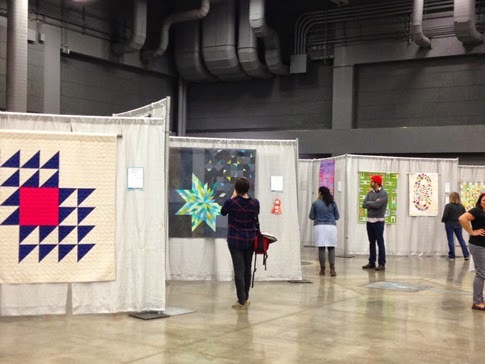 If you're visiting from the Blogger's Quilt Festival, hello... and thanks for stopping by! This is my Deconstructed Lonestar quilt. I'm not going to say much about it here, because you can read all about the process and inspiration behind it in this previous post. I will say that I'm very proud of this quilt and immensly flattered that it won a second place award at this year's QuiltCon show in the Modern Traditionalism category. I completed the quilt in November of 2014, just in time to enter it in the QuiltCon show. Here's a detail view of the spiral quilting. You might also notice that many of the gray background fabrics have been overdyed. Do you recognize any of them as originally black-on-white prints?! Dyeing quilting fabrics was a first for me, and something I really enjoyed experimenting with. 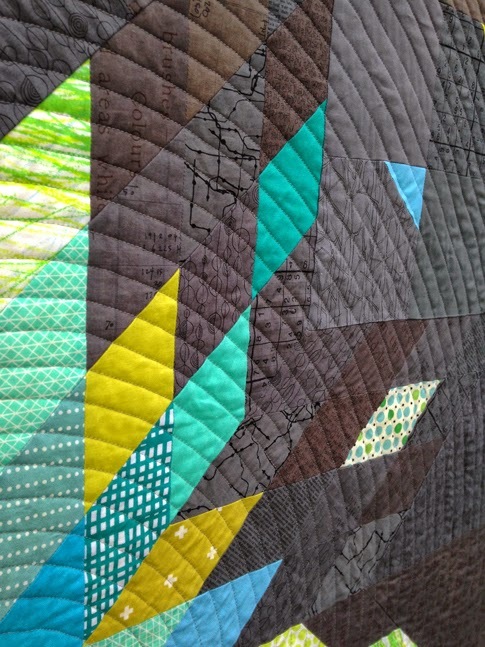 Be sure to check out all the quilts in the Blogger's Quilt Festival over at Amy's Creative Side. I'm entering this one in the Small Quilts category. I'm entering my Bright Lights quilt in the festival, and realized I hadn't yet shared it here on the blog. This is the second quilt I've made. Ever. That's right. I made a quilted table runner in 2012-13 (It took a while! ), and then this one, so it was very much a learning process for me. Which, really, every quilt is! 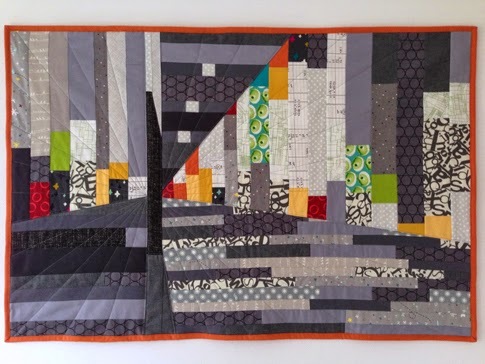 The design was inspired and made for a 'Modern in the City' challenge organized for the International Quilt Festival show in Chicago last year. 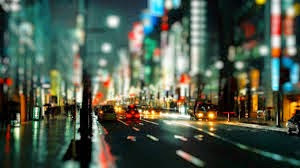 It's loosely based on this photo I found through a Google image search: a blurry image of a city street at night. (Unfortunately, I couldn't find anything more to credit the artist/photographer, other than the copyright info above.) I blocked out some general shapes/sections based on the one-point perspective of the photo, then improvised the piecing using different width strips. 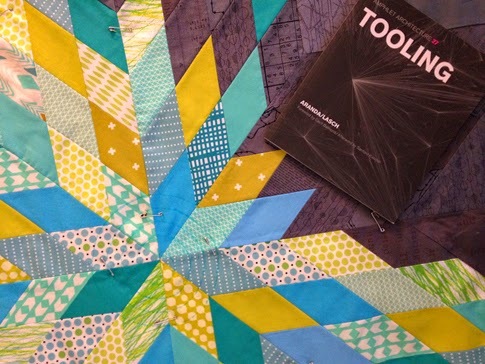 I pieced the top while at a retreat with the the Chicago Modern Quilt Guild in March 2014, just a few days before the deadline. Then I quilted it to emphasize the perspective lines. The fabrics were all from my stash. I didn't really know what I was doing, which made it a fun challenge. I just put it together without thinking about it too much; it felt a little like painting! This was also the first time I needed to bury threads, since my only other quilt was a narrow table runner that I quilted so all the stitching ended at the binding edges. And I attached the binding by machine because I worried I wouldn't finish it in time otherwise. Since then, I've come to love binding by hand, and wouldn't dream of doing it otherwise! 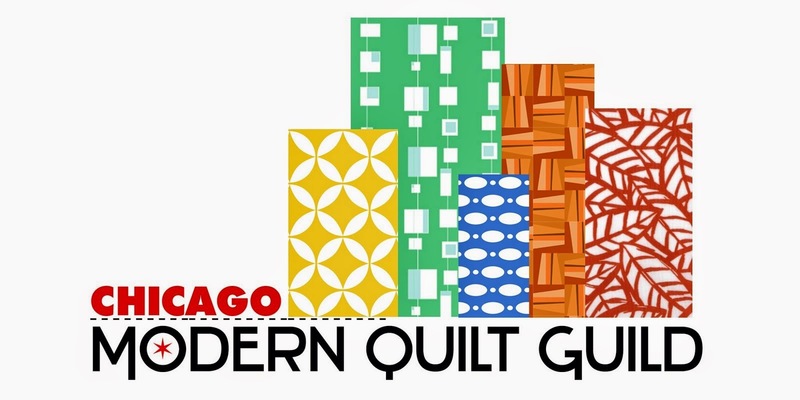 It was fun to see it in the IQF show, along with other quilts created by members of both the Chicago and Naperville Modern Quilt Guilds. I hope you enjoy seeing it (and all the other quilts!) 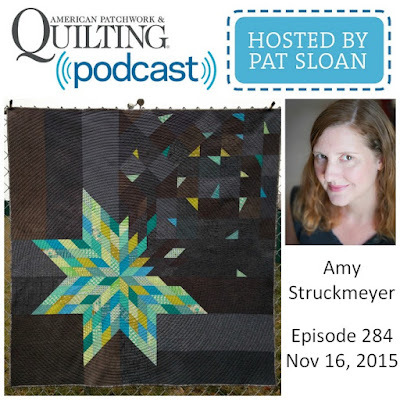 in the Blogger's Quilt Festival over at Amy's Creative Side. I'm entering it in the Original Designs category. Today (and the rest of this week) is SewMamaSew's Giveaway Day. Lucky you. And me. ;) You have a chance to win fabulous sewing-related prizes, and learn about blogs or Instagram feeds you might be missing out on... and I get to meet some of you! 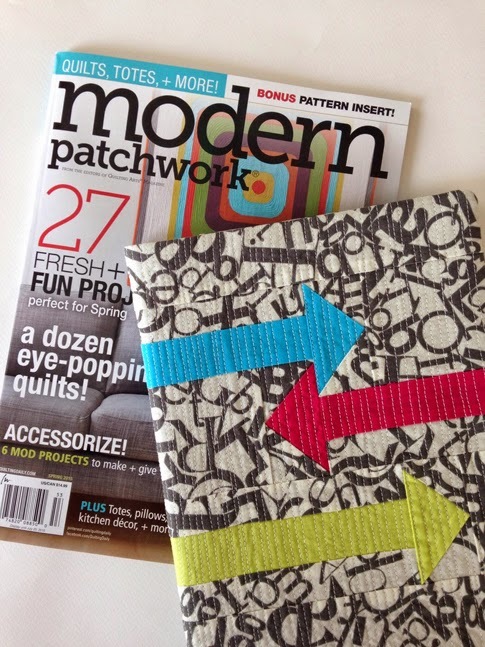 I'm giving away the current issue of Modern Patchwork magazine, plus a kit (fabric and batting) to make the Arrow Sketchbook Cover featured inside. All you'll need to provide is a bit of sewing time and a sketchbook! 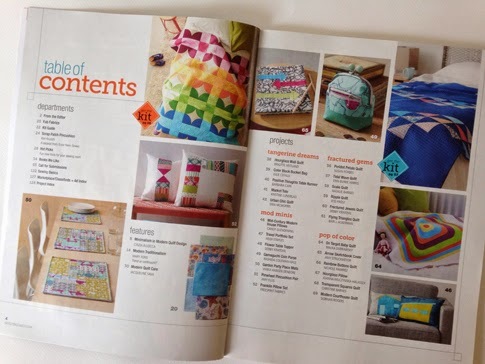 Plus, look at all the other fabulous projects you could make from the magazine!! 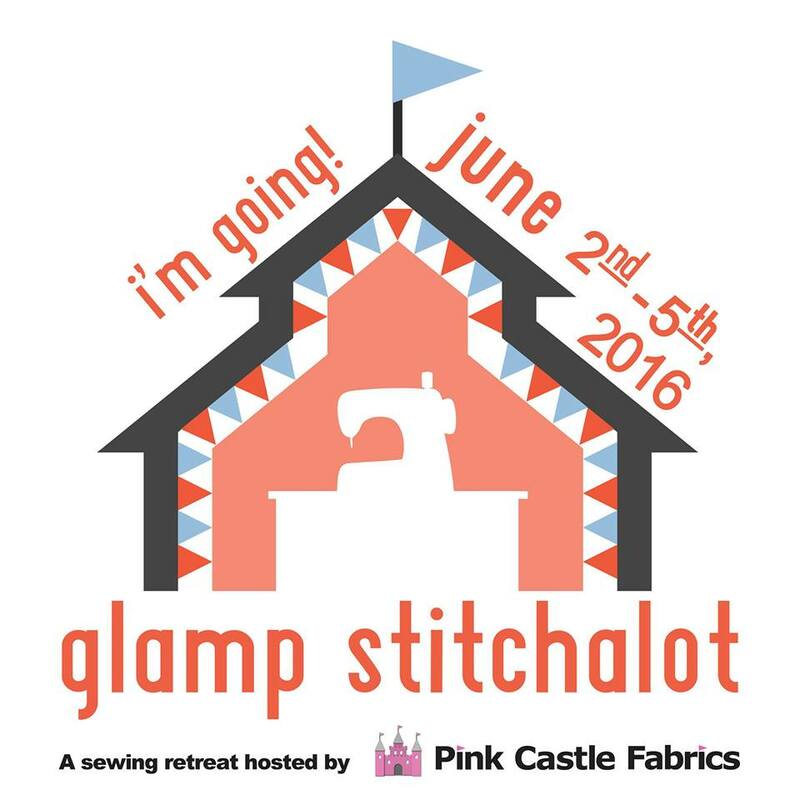 To enter, please leave a comment letting me know what your favorite thing to sew is. Do you like quilting, or sewing garments, bags, soft toys... or something else?? I'd love to know! You have from now until Sunday, May 10, at 5:00 pm PST to enter. After that, I'll randomly choose one winner. Please be sure I have a way to contact you if you're a winner! 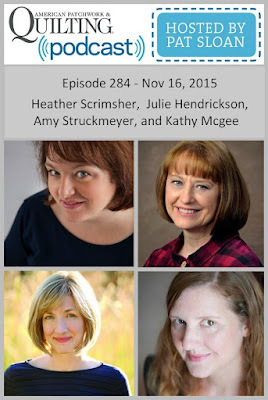 If your email is not connected to your blogger profile, please include it in your comment. I'm not requiring any extra hoops to enter, but I'd be absolutely flattered if you choose to follow me through Bloglovin' or on Instagram. Thanks, and good luck!! I created Deconstructed Lonestar specifically for QuiltCon 2015, the international conference and show by and for The Modern Quilt Guild. I was inspired by a traditional lone star quilt my mom made for me when I was in my twenties, long before I was interested in quilting myself. I was looking at it recently and thinking about how striking the pattern is and how it might look with a more modern spin. I was also inspired by this and this and this and this, all modern versions of the lone star pattern. I then started to think about the idea of the star breaking off and exploding into space. The concept of combining a traditional pattern with current fabrics and improvisational piecing resonated with me. I drew up a basic star pattern, offset it towards a lower corner, and starting sketching over it with colored pencil. I decided early on to use a cool palette of blues and greens for the star, and that I wanted those colors to pop against a darker background. I was looking for more depth and interest in the negative space than I thought I could achieve with a solid gray. I also wanted the construction of the piecing to be obvious, as I feel like that is a big part of what makes the lone star pattern so beautiful. Since I knew it would be impossible to find assorted dark gray prints that worked together, it became clear that I should overdye the background fabrics myself, something I hadn't done before. Because (ha!) why would I make the process easy??! In the end, after collecting a variety of black-on-white prints, and learning as much as I could from everyone I know who had ever dyed fabric, I set to work. It took two tries -- you can see the first (too light) version on the left and the final version on the right. You can see my partially completed sketch for the design in the upper left corner of the photo above. That's as far as I got with planning out the design. I laid out the "shards" of the broken star as I went, until it looked right. Here it is on the floor on my living room, almost complete! 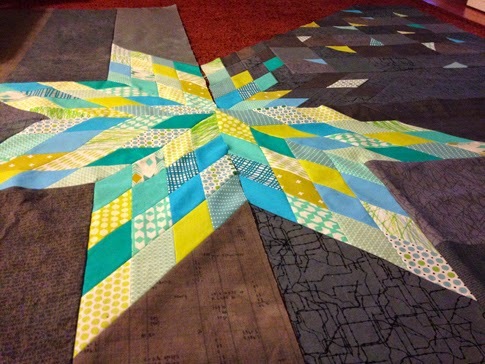 I pieced the star in somewhat random strips that I then cut at a 45-degree angle, similar to this tutorial. 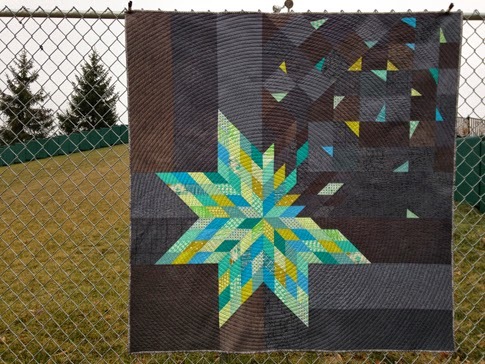 The broken points of the star are pieced in the same manner, but with more carefully placed strips of the gray fabric added, so those parts became negative space and faded into the background. 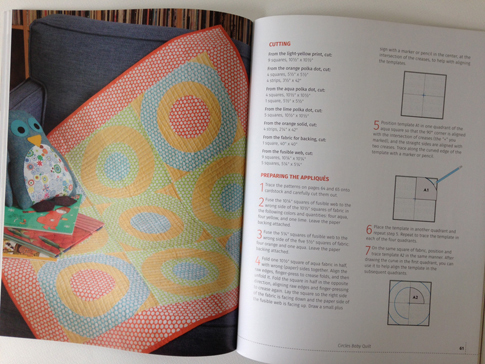 The quilting was influenced by a "Recipe for Spiraling" in the book Pamphlet Architecture 27: Tooling, shown above. 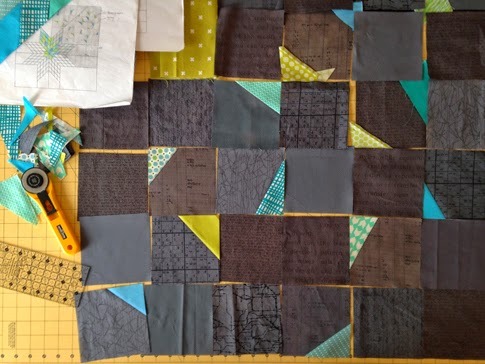 I'm not adept at free motion quilting and was looking for a dynamic quilting design that I could quilt myself with a walking foot. The authors of the book write that "Spiraling produces a shape unlike any other because it is seldom experienced as geometry, but rather as energy." Seemed perfect to me. You can see that I sketched the beginning of the spiral on the quilt top. Thankfully, once it got big enough, I was able to use the edge of the walking foot to continue the shape until it was complete. I love how the gray fabrics have a similar tone (or is it shade? ), yet are still distinct. I really pushed myself with this quilt and learned so much in the making of it. It also reinforced for me how much I enjoy the process of design. I finished binding and photographing the quilt the day submissions were due for the QuiltCon show, and was thrilled to find out a few weeks later that it was accepted into the show! I really enjoyed designing this bright and colorful cross-body bag. 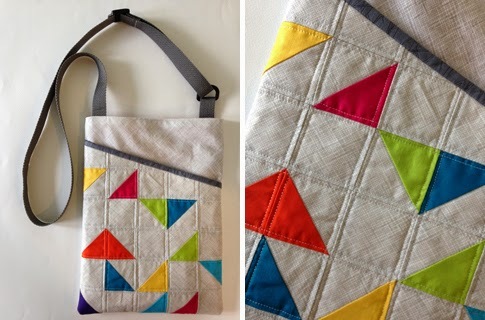 The angled front pocket is essentially a tiny quilt -- and a fun study in half square triangles. The bag measures about 10-inches wide by 13-inches tall, and the strap is adjustable up to 53-inches long. 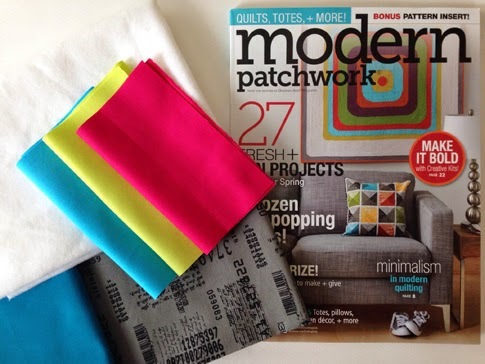 Modern Patchwork is one of my favorite quilty/sewing magazines, and, as usual, there are some great quilts and smaller projects in this particular issue. 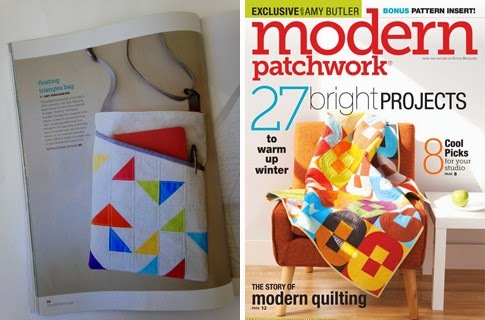 I'm thrilled to be sharing the pages with some of my maker/designer idols, including Rashida Coleman-Hale (Her Modern Hexies quilt is gorgeous!) 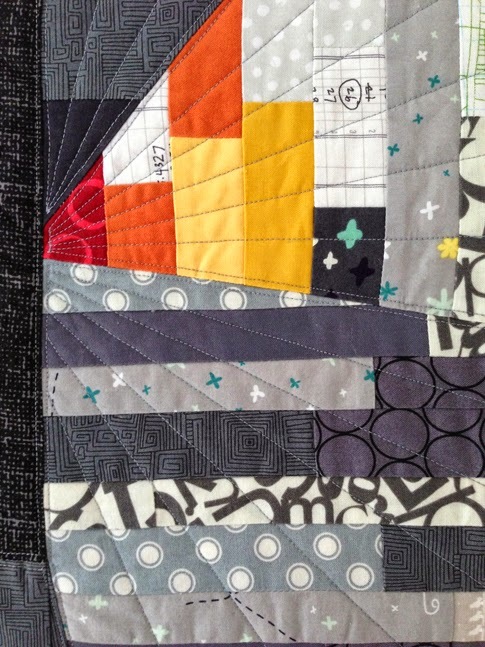 and Malka Dubrawsky (Don't you think her Mod Ovals Quilt makes a beautiful cover photo?). 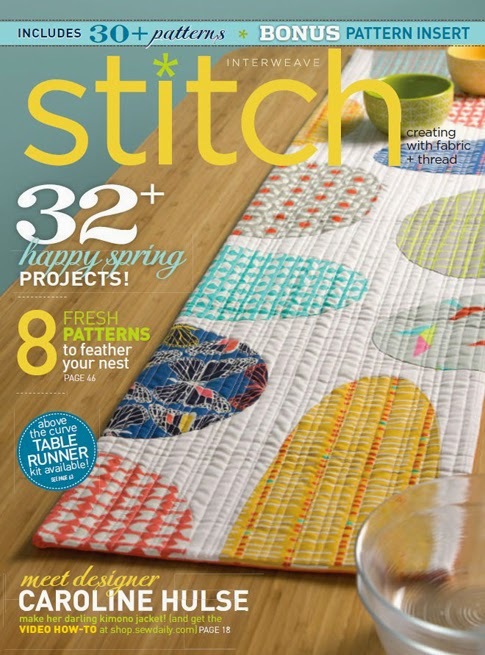 Speaking of cover photos (and publications), I'm super excited that my Above the Curve table runner made it on the cover of the Spring issue of Stitch!! What an honor... and a surprise! I haven't received my physical copy yet. When I do, I'll be sure to post more about that design, and the inspiration behind it. 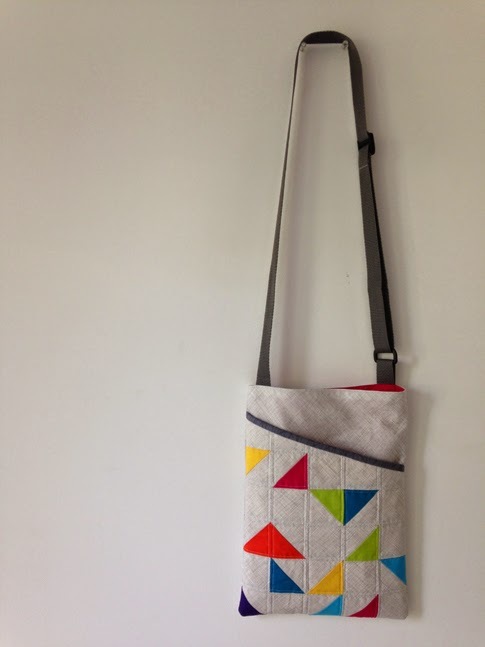 And, if you sew your own version of the Floating Triangles bag, or any of my patterns, I would LOVE to see it! Tag me on Instagram (@formwork), post a comment here, or email me to let me know. Thanks so much!